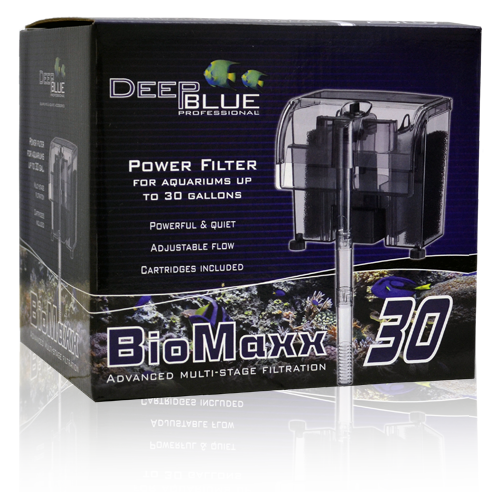 Deep Blue Professional BioMaxx 30 Gallon Power Filter The BioMaxx 30 gallon power filter is the perfect intermediate-size tank filter. Quiet and efficient, it comes with two disposable BioMaxx Medium carbon-filled cartridges for chemical and mechanical filtration. The cartridges are completely sealed and have no-mess handles for neat and easy cartridge changes. The BioMaxx 10/30 cartridge is also compatible with Whisper 10 and Topfin 10 filters. The BioMaxx 30 has a self-starting siphon, an adjustable flow control, and is rated for up to 160GPH. The filter also includes a replaceable foam BioSponge for biological filtration. 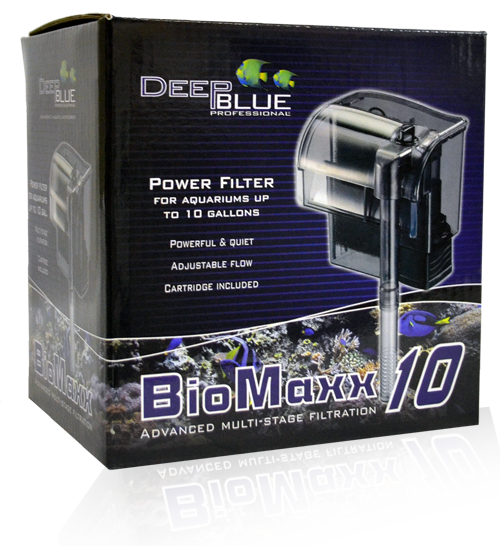 Deep Blue Professional BioMaxx 55 Gallon Power Filter The BioMaxx 55 gallon power filter is the perfect large-size tank filter. Quiet and efficient, it comes with a disposable BioMaxx Large carbon-filled cartridge for chemical and mechanical filtration. The cartridge is completely sealed and has a no-mess handle for neat and easy cartridge changes. The BioMaxx 55 cartridge is also compatible with Whisper 40 and Topfin 40 filters. The BioMaxx 55 has a self-starting siphon, an adjustable flow control, and is rated for up to 220GPH. The filter also includes a replaceable foam BioSponge for biological filtration. 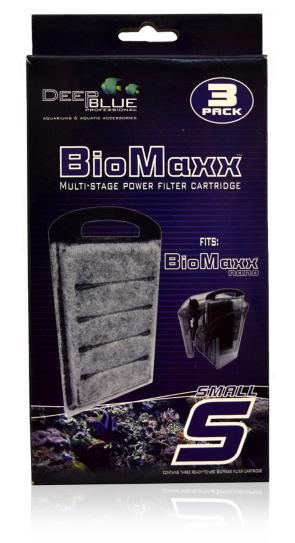 BioMaxx Nano Carbon Cartridge 3Pk BioMaxx Carbon cartridge inserts combine the chemical filtration of carbon with the mechanical filtration of premium filter fiber in a no-mess one-piece unit that is easier to change than a light bulb.  Fits Deep Blue BioMaxx, Red Sea and Azoo Nano filters. Rigid grid design keeps carbon suspended across more of the surface area than other cartridges, allowing more interaction between thecarbon particles and the water. Easy-grip handle keeps hands dry during filter maintenance. 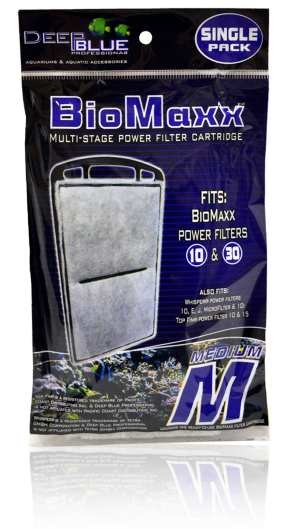 Deep Blue Professional BioMaxx Medium Power Filter Cartridge 1Pk BioMaxx Medium (10/30) Power Filter Cartridge Single Pack BioMaxx Power filter cartridges are the ultimate in performance and convenience. The multi-layer polyfiber outer shell traps debris and organic particles, while the premium carbon inside absorbs dissolved contaminants, odors, toxins and discoloration. The rigid frame incorporates a media-grid design that ensures even distribution of the carbon granules. The one-piece sealed design allows for quick and easy cartridge replacement, while the convenient top handle keeps hands clean and dry during filter maintenance. The BioMaxx Medium cartridge fits BioMaxx 10 and 30 filters, and also fits Tetra Whisper and Topfin power filters too. Deep Blue Professional BioMaxx Medium Power Filter Cartridge 3Pk BioMaxx Medium (10/30) Power Filter Cartridge 3-Pack BioMaxx Power filter cartridges are the ultimate in performance and convenience. The multi-layer polyfiber outer shell traps debris and organic particles, while the premium carbon inside absorbs dissolved contaminants, odors, toxins and discoloration. The rigid frame incorporates a media-grid design that ensures even distribution of the carbon granules. The one-piece sealed design allows for quick and easy cartridge replacement, while the convenient top handle keeps hands clean and dry during filter maintenance. The BioMaxx Medium cartridge fits BioMaxx 10 and 30 filters, and also fits Tetra Whisper and Topfin power filters too. 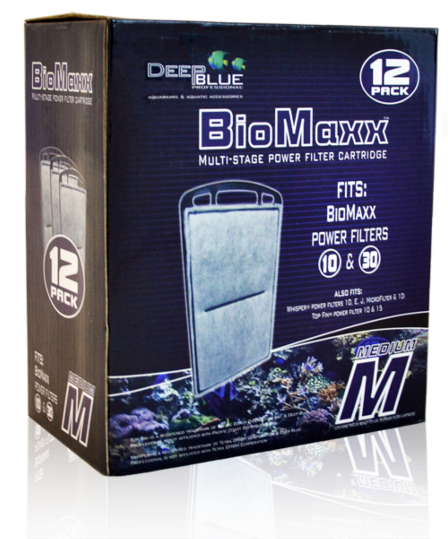 Deep Blue Professional BioMaxx Medium Power Filter Cartridge BioMaxx Medium (10/30) Power Filter Cartridge 12-Pack box BioMaxx Power filter cartridges are the ultimate in performance and convenience. The multi-layer polyfiber outer shell traps debris and organic particles, while the premium carbon inside absorbs dissolved contaminants, odors, toxins and discoloration. The rigid frame incorporates a media-grid design that ensures even distribution of the carbon granules. The one-piece sealed design allows for quick and easy cartridge replacement, while the convenient top handle keeps hands clean and dry during filter maintenance. The BioMaxx Medium cartridge fits BioMaxx 10 and 30 filters, and also fits Tetra Whisper and Topfin power filters too. 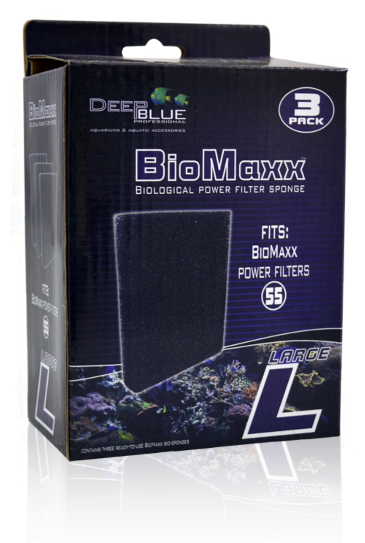 Deep Blue Professional BioMaxx Medium BioSponge 3Pk BioMaxx Medium (10/30) BioSponge 3-Pack A healthy aquatic environment depends on biological filtration. 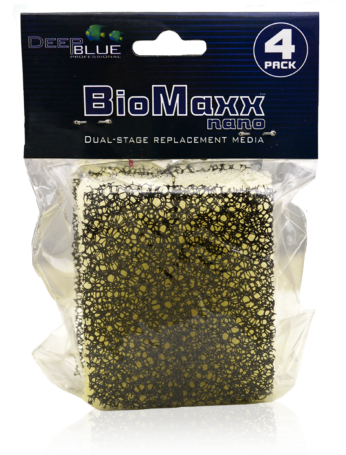 BioMaxx BioSponges provide surface area for much-needed beneficial bacteria to grow. 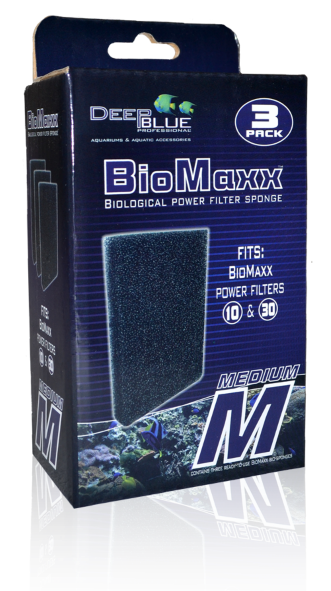 The BioMaxx Medium BioSponge fits BioMaxx 10 and 30 filters. 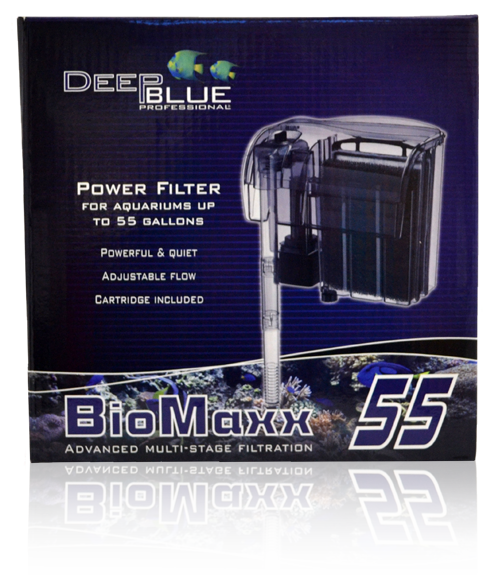 Deep Blue Professional BioMaxx Large (55) Power Filter Cartridge BioMaxx Power filter cartridges are the ultimate in performance and convenience. The multi-layer polyfiber outer shell traps debris and organic particles, while the premium carbon inside absorbs dissolved contaminants, odors, toxins and discoloration. The rigid frame incorporates a media-grid design that ensures even distribution of the carbon granules. The one-piece sealed design allows for quick and easy cartridge replacement, while the convenient top handle keeps hands clean and dry during filter maintenance. The BioMaxx Large cartridge fits BioMaxx 55 filters, and also fits Tetra Whisper and Topfin power filters too. 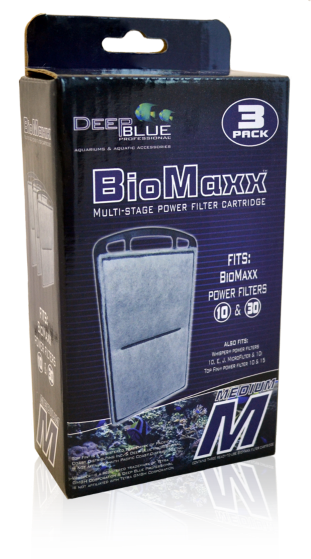 Deep Blue Professional BioMaxx Large (55) Power Filter Cartridge 3Pk BioMaxx Power filter cartridges are the ultimate in performance and convenience. The multi-layer polyfiber outer shell traps debris and organic particles, while the premium carbon inside absorbs dissolved contaminants, odors, toxins and discoloration. The rigid frame incorporates a media-grid design that ensures even distribution of the carbon granules. The one-piece sealed design allows for quick and easy cartridge replacement, while the convenient top handle keeps hands clean and dry during filter maintenance. The BioMaxx Large cartridge fits BioMaxx 55 filters, and also fits Tetra Whisper and Topfin power filters too. 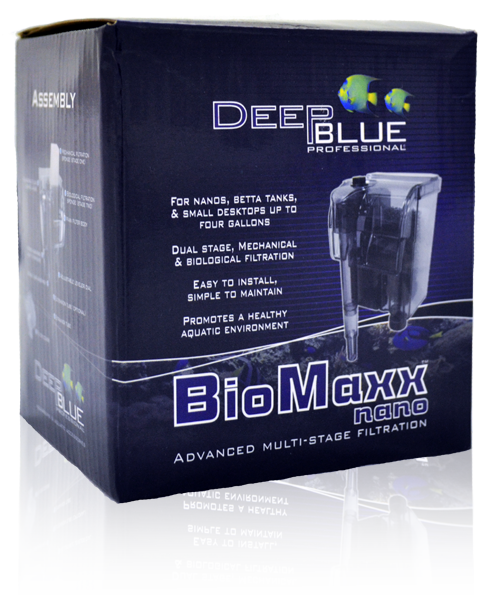 Deep Blue Professional BioMaxx Large (55) BioSponge 3Pk A healthy aquatic environment depends on biological filtration. BioMaxx BioSponges provide surface area for much-needed beneficial bacteria to grow. 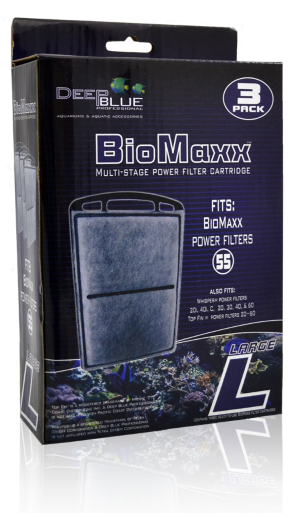 The BioMaxx Large BioSponge fits BioMaxx 55 filters.